I am feeling guilty about being so tough on Ms. Cagan. So I decided to put this picture up, to make a point. If I saw this picture, and it wasn’t attached to some dumb-assed thing like, “I hate all Iranians”, I wouldn’t think much. 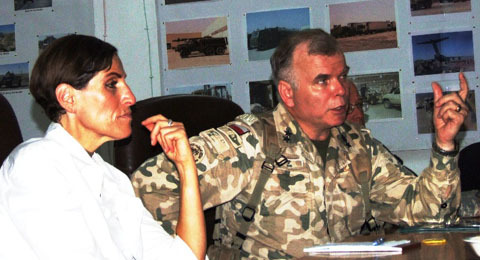 Here is a woman with very strong features, talking shop with some military dude. That’s it. She is rather striking to look at, but no more. It can’t be easy to live in this appearance obsessed society with such an unconventional look. I tee’d off on her because of her words, first, and that completely ridiculous get-up. Had she been drop dead gorgeous, I still would have gone after her. 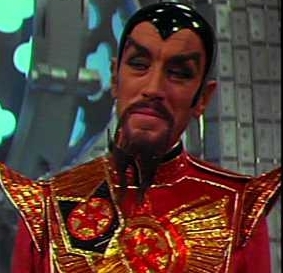 Plus, as someone pointed out in the comments of Sadly, No!, she looks like one of Ming the Merciless’s hench(wo)men. And Flash Gordon references always get me going.